Last Thursday my book club got together and discussed Jane Austen's last novel, written while she was sick and published after she died. Short summary: 27 year old spinster Anne Elliot regrets ever being persuaded not to marry her first love Frederick Wentworth - especially when he shows up 8 years later. The group's verdict: We all enjoyed this one, even if it wasn't our favorite Austen (Pride & Prejudice and Emma fill that slot for us). We had a lively discussion. We listed many reasons for hating Anne's sisters and father (all very self-absorbed), and wondered why teenaged Anne would defer her own happiness for the likes of them. We pointed out that Anne's "loss of her bloom of youth" was probably due more to her sorrow over a bad decision than aging (because 27 is so totally NOT old). And we reasoned that if Jane hadn't died after writing her first draft, she probably would've written a much better scene at the end where Anne and Wentworth walk back to her house after he writes her that letter (and oh! that letter!). As it is, it seems like a place holder to be fleshed out during the revision process. Up next: We're taking a break for July, and then reading Anne Patchett's THE PATRON SAINT OF LIARS for August. I actually read this title years ago and didn't much like it...but I do have a lot of friends who loved it. So it should be an interesting one to discuss! My favorite it P&P, but I did adore this one as well. Austen is so adept at creating characters that are maddening, but in a fun way. You almost have to laugh at the ones who are over-the-top asses! And that letter at the end...wasn't that awesome? I think you are right - Austen definitely would have refined the ending had she lived. I just finished a biography on her (reviewed it last week) and she was big into revisions. I haven't yet read this one. I am kind of trying to ration the Austen since I know the supply is finite. I have a really nice volume that combines all the books in one big volume, so when I read this, it will be from that book. Great review! It sounds like you have a really cool book club! This is my favorite Austen. It's the saddest and weirdest, I find, and I love the idea of Anne Elliot being a 27 year old being a useless old hag. It makes me snort, just thinking about it. I haven't read Persuasion but I would love to read it. No time of course. It seems to have a rather different premise but so few books can beat P&P. This one is probably my favorite as well. There's just something about Anne. I still haven't finished this novel yet, but it is on my to-do list for the everything austen challenge! Persuasion is on my list of books to read before the end of the year. I'm looking forward to it, though not sure it can top P&P. I knew it was Austen's last book, but I never thought of it that way: that the ending was a placeholder for revisions. It does make a lot of sense. 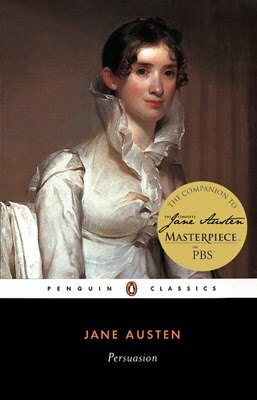 This is going to be my next Austen - I hope to get to it sometime this summer. We'll see if it beats P&P and Emma for me! Persuasion is my favorite Jane Austen novel. I love it and plan to reread it for my Flashback challenge, if I can ever maneuver my reading schedule enough to et back to it! This is my favorite Austen. Second chances are hard to come by, and this is an amazing tale! Plus Capt Wentworth is the stuff dreams are made of!! I wouldn't say this is my favorite (that honor would go to either Emma or Mansfield Park) but I really liked it. I have to admit this is one of my least favorite Austen novels because I think Captain Wentworth is a jerk. I'm going to read this one during the my summer break! It's been years since I read Persuasion, and I hardly remember anything about it now. I doubt it'll beat Emma out as my favorite Austen, but we'll see. I'm definitely going to read it again soon. Persuasion is definitely my favourite Austen. I need to reread it, as well as Emma - I never quite liked that one as much as I do Persuasion or Pride and Prejudice.